This course is a study of U.S. society and culture from 1945 to the present. During the semester we will investigate cultures of conformity and protest, consider the dynamic relationships between foreign policies and domestic concerns, and analyze changes and continuities in gender and race relations. Topics we will address include the onset of the "atomic age," the significance of the Cold War, the status of American labor in a globalizing economy, the experience and lasting effects of civil rights movements, and the relationship between mainstream commercial/corporate culture and alternative, ethnic and countercultures. 2/10 Library Research Workshop. Meet in Library Electronic Classroom 2041. 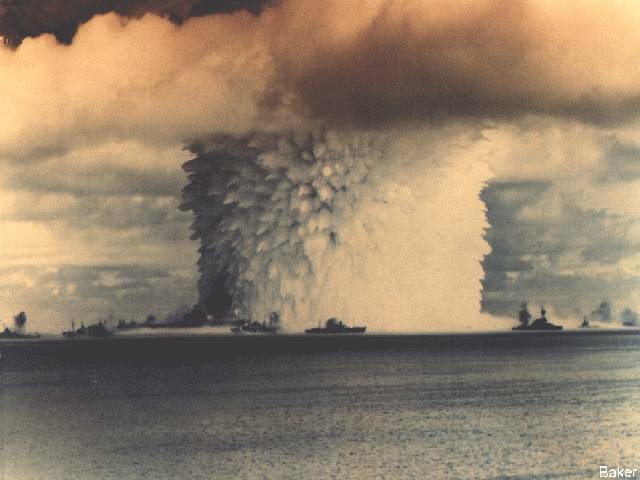 *Above photograph of Atomic Bomb Test Baker, Operation Crossroads, 21kt, Bikini Islands, July 1946 (www.zvis.com/nuclear/nukimgs.shtml).